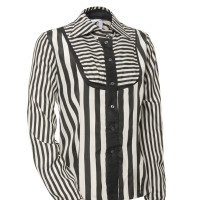 This fitted blouse is a graphic play of horizontal and vertical lines, thick and thin. with transparent, black silk cotton behind it. The shape of the collar goes from round curves to pointy ends and is lined. 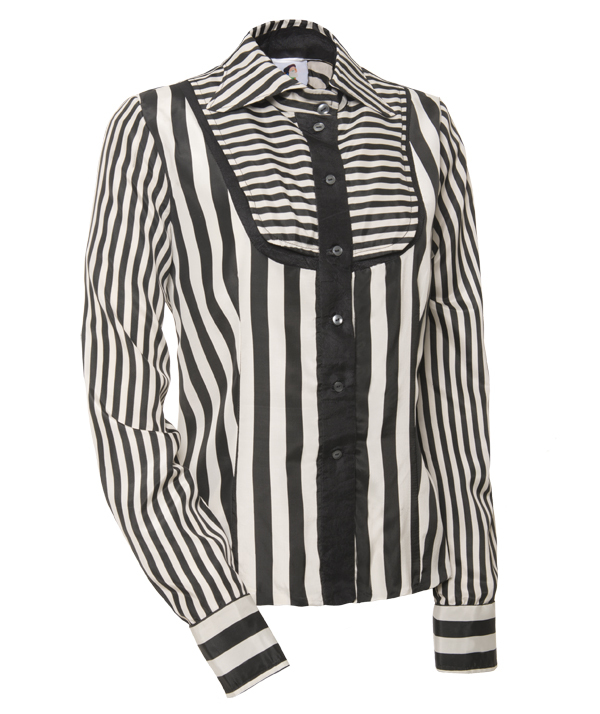 The sleeves have, by the opening to the cuffs, a black silk cotton finishing. Buttons are dark grey with a mother-of-pearl glow. Fabric is very light and flowy, with a silk/satin feel. 100% polyester, with 100% silk cotton lining. How to wash? Turn inside out. at medium heat, can be dry cleaned, hang to dry.